Two Sussex police constables questioned over their conduct at the site of the Shoreham air crash have left the force. The two probationary officers, aged 23 and 24, appeared before Assistant Chief Constable Robin Smith, who recommended they should be dismissed. Both officers have since resigned, Sussex Police said. 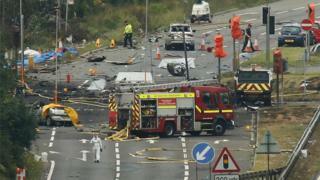 The investigation came after they filmed themselves near the site of the air crash where 11 people died after a jet crashed on to the A27 on 22 August. The recording was made at the police cordon and accompanied by an inappropriate and offensive message. Sussex Police launched an internal investigation after the footage and message were sent on social media to a colleague who reported the pair. The force said both constables exercised their right to tender resignations under regulation 13, a provision specific to probationary officers. Chief Constable Giles York said the pair were "clearly remorseful" and had acknowledged the impact of their actions, but would not go on to become "well-conducted officers" in his view. "When it really mattered the officers failed to show understanding and compassion for the victims and their families," Mr York said. Genuine mistakes were forgivable, he added, but said the behaviour of the two officers was "inexplicable and caused unnecessary distress to the families of those involved". The Sussex Police Federation, which had represented the two officers throughout the case, said: "We are content that they have been judged fairly and accept and understand the decision that has been reached."